From a single shelf of books . . .
As long ago as 1949, the Reference Department at the Bennett Martin Public Library recognized the importance of gathering information about Nebraska authors. 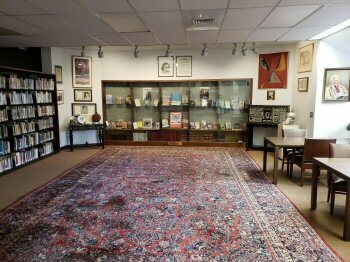 Over the years, what was once a single shelf of books has now grown into a room-sized collection, known as the Jane Pope Geske Heritage Room of Nebraska Authors. Our mission is to preserve and promote works by and about Nebraska authors, past and present. The collection strives to gather in one location a representative sample of written works by all Nebraska authors. Today, the Heritage Room contains more than books alone. 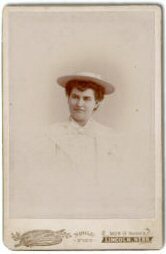 One can also find archives of unpublished correspondence and manuscripts by and about Nebraska authors, and information files that trace author careers in clippings from newspapers, magazines, and literary journals. The Heritage Room preserves photographs, audio and video cassettes, compact discs, original artwork by authors and their illustrators, and other memorabilia that document the lives and work of Nebraska authors. Nebraska possesses a literary tradition of striking quality. The fiction of Willa Cather and the histories of Mari Sandoz are recognized as among the most knowledgeable and detailed explorations of the settlement of the last American frontier. Native Americans have found Nebraska poet John Neihardt’s record of his encounter with Black Elk crucial in preserving their own spiritual traditions and history. Nebraska has produced some of the English language’s most widely published and influential nature writers. Nebraska poets and mystery writers, social critics and romance novelists, historians and journalists have achieved regional, national and international recognition. Though writing is a solitary pursuit, few writers have learned their craft or found their calling without the encouragement and constructive criticism of teachers and peers. Nebraska’s literary community has been lively and ambitious ever since the first days of European settlement. The state sustains a surprising number of active literary organizations, formal and informal writer’s groups, and local and regional publications. John H. Ames Reading Series — This series showcases Nebraska authors reading their own works. Videotapes of these readings, and other special programs, are available for local checkout and through Interlibrary Loan. The Heritage Room Vertical Files — The Heritage Room maintains over 600 information files on Nebraska authors and related subjects which are updated regularly. Together with NAIL, these files are a window on the careers, connections, publications, and public and peer reception of Nebraska’s writers. Heritage Room Tours/Talks — Many civic groups and school classes come to the Heritage Room for guided tours. Staff are also available to provide programs. Writers Write Workshops — In this popular program for 8th graders, students spend a morning writing and reading their work under the direction and encouragement of several local authors. This program is sponsored by the Nebraska Literary Heritage Association. Writers on the Plains — This 14 minute video provides a tour of the Heritage Room collection and describes the role of the Nebraska Literary Heritage Association in celebrating, preserving and promoting the work of Nebraska authors. Viewers will appreciate the richness of Nebraska’s Literary culture through the voices of our celebrated writers. The Nebraska Literary Heritage Association — The NLHA supports the Heritage Room through the Heritage Room Endowment Fund and volunteer projects. It is only through NLHA’s efforts that we can work toward preserving and promoting Nebraska’s literary tradition. A history of the NLHA is available on their site. For more information about NLHA’s activities or to become a member, please call 402-441-8516. The Heritage Room is located on the third floor of Bennett Martin Public Library in Lincoln, Nebraska. The books do not circulate and special care and preservation measures help ensure their longevity. The Heritage Room collection is a multifaceted reflection of the history and literary culture of the state. We have more than pioneer stories. There are books on every topic, including philosophy, poetry, nature, psychology, politics, and pop culture. Our shelves contain many entertaining and thought provoking books for children by Nebraska authors. Our fiction collection includes romance, fantasy, contemporary, western, and mystery novels to suit every taste. Heritage Room staff will be glad to assist you with any questions you may have about Nebraska authors. The Nebraska Federal Writers’ Project: Remembering Writers of the 1930s — This project was supported in part by the United States Institute of Museum and Library Services under the provisions of the Library Services and Technology Act, administered through the Nebraska Library Commission.